Pigsodus is a point and click adventure game with RPG elements. Use your wits to solve puzzles, test your reflexes in dynamic minigames and explore the mysterious, pigcelart world inspired by Orwell's Animal Farm. They say seeing is believing - so why don't you play our little demo that we've put together to showcase our ideas. 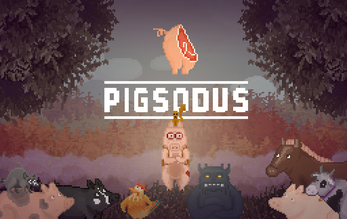 Pigsodus will tell an epic story interlaced with bursts of humor and an occasional animal pun. Our protagonist - Horace Oinkstein is a gentlepig with an aptitude for science. Together with his best pal Eggdar the Rooster they will embark on a quest to save their friends. They are aided by a wide array of goofy, memorable characters such as The Overthinking Cow, Alcoholic Squirrel or The Gadget Horse. In order to succeed Oinkstein will have to follow the visions of mysterious toad god, dabble in black magic, visit HAARP and dive with an aquarium on his head. These adventures won't leave him unscathed and you'll witness Horace turn from an insecure, naive pig to a truly shining bacon of hope. On the other side of the spectrum we have the villain - Theodore Cleaver - a merciless butcher who raises pigs in order to feed his overweight mother. With a bunch of buddies from his hunting club he will use whatever means necessary to crush the pig rebellion. We believe that animal farm can be a perfect stage for a dramatic struggle. Imagine Hamlet with actual ham!